Belgian authorities search house in Brussels and detain suspect in connection with November 13 Paris attacks. Belgian authorities investigating their country's links to last month's attacks in Paris have searched a house in Brussels and detained an unidentified person for questioning, The Associated Press (AP) reported on Sunday. Federal prosecutor Eric Van der Sypt said the search was continuing. The building in question is located between the center of the Belgian capital and the Molenbeek district where some of the perpetrators of the November 13 attacks, included suspected ringleader Abdelhamid Abaaoud, had lived. 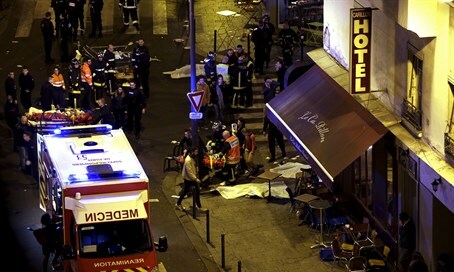 Van der Sypt did not provide details of the search or the person detained, but said authorities are still trying to establish what connection they may have to the attacks in the French capital in which 130 people died. The Belgian prosecutor said that once more is known, an official statement will be issued on Monday, according to AP. Molenbeek is a run-down Brussels district dubbed a haven for Islamist extremists. Belgian police conducted several raids on the area following the Paris attacks. Belgium's security services were on the defensive after the attacks when they were accused of blunders, infighting and worrying leniency towards radicalism that let the perpetrators slip under the radar. A search remains underway for Belgian-born Salah Abdeslam, who is one of the main suspects in the attacks. Belgian police failed to locate Abdeslam in the raids after the Paris attacks, and it is believed he was successful in fleeing to Germany. Previously, senior officials in Hungary said Abdeslam traveled to Budapest before the Paris attacks where he "recruited a team" from unregistered migrants passing through.